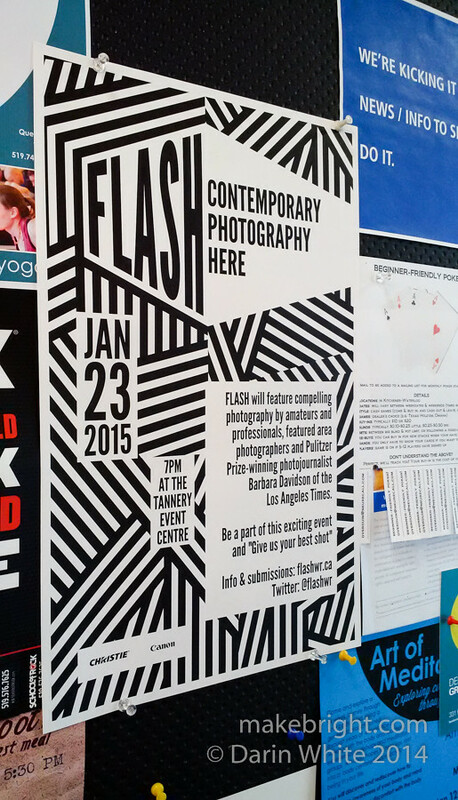 Just pinned up this FLASH poster, fresh from the presses at Cober Solutions down on Strasburg Road in Kitchener. We needed some posters/postcards/stickers to help spread the word on FLASH and Tony reached out to Karl Allen-Muncey at Cober who generously helped us out. Merci beaucoup! We need your help too: spread the word on FLASH, buy tickets, submit your best photo. And show up. Friday January 23. Get that in your calendar right now. This entry was posted in event and tagged photography. Bookmark the permalink. You put the ace in Bearface, Jon Johnson!